“The Hood - A Mommy War Memoir" by Pamela Conley Ulich takes a hard look at whether "Leaning In" to a career is a good philosophy for all. 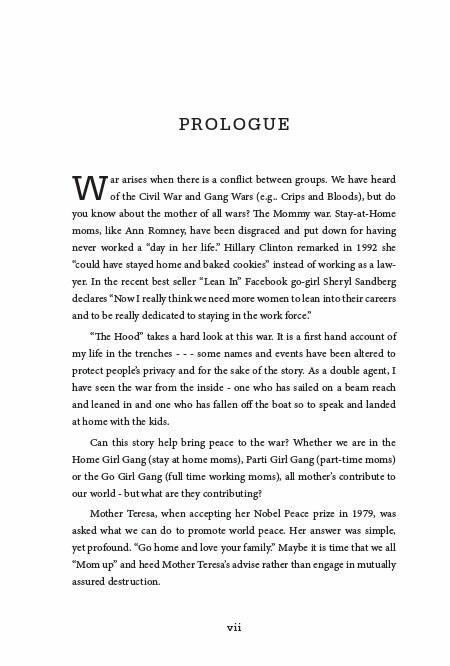 "The Hood" is a first hand account of Pam's life in the trenches. Pam sailed on a beam reach and leaned in and also fell off the boat so to speak and landed at home with the kids. 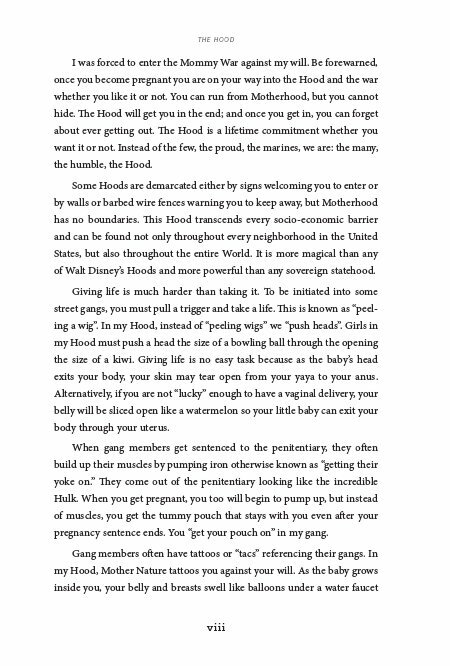 The Hood is the definitive book for moms who are considering how to balance a career and raise a child. Can a feminist chose children over a career? Can Crips (working Go Girls) and Bloods (stay at Home Girls) be friends? 1999. It was the end of the century. While people partied to the artist formerly known as Prince’s song “1999”, I was busy with my career. Not only was I a lawyer, I was the Hollywood Resident Counsel at the Screen Actors Guild and the litigation supervisor. I was helping the “working class” actor get overtime or even proper meals. I was also in denial about being pregnant. I didn’t even think about being a mother until I was hospitalized with a kidney infection and was told by my doctor that I could "loose the baby" in my 8th month of pregnancy. 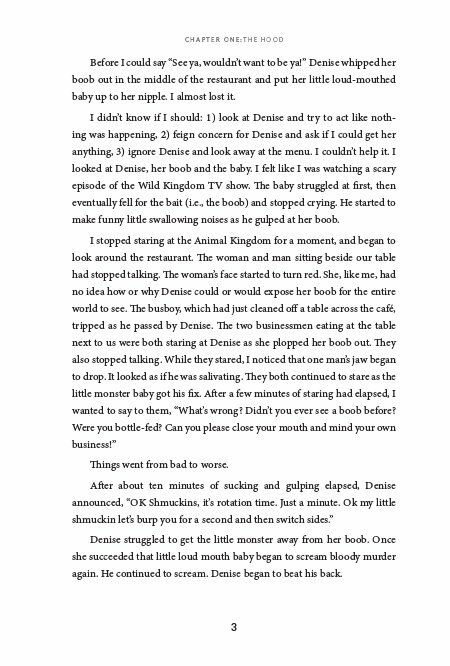 While I was in the hospital, I started to want to become a mother, and started writing a book to my daughter instead of working on legal briefs. After my baby girl was born, I spent four wonderful months bonding with her. After my Family and Medical Leave Act time was up, I went back to work full-time and full throttle. I agreed Hilary Clinton's Mom philosophy - - - instead of staying at home and baking cookies, I continued to work as a lawyer. I was a member of the triple G – “Go-Girls-Gang”. The triple G girls are moms with careers who work full-time away from their children. I continued to work as a lawyer up until the day I delivered my second baby – a beautiful boy in July 2001. On 9-11, while I was at home on maternity leave and nursing, I watched twin towers fall like a stack of lego building blocks. The devastating images are forever etched in my mind. Witnessing that day, even only on television, shook me to my core. I, like most everyone else in America, was forever changed. I submitted a proposal outlining the pros and cons of letting allowing a part-time job and scheduled a meeting to ask the Executive Director of the Screen Actors Guild, Bob, if I could go part-time with a 50% pay cut. I was ready to join the PG gang. Bob looked at me, paused for about one second and said: “No. Working part-time as a lawyer sets a dangerous precedent. If you go part-time, then everyone would want to go part-time.” He looked down. There was no room for discussion or debate. 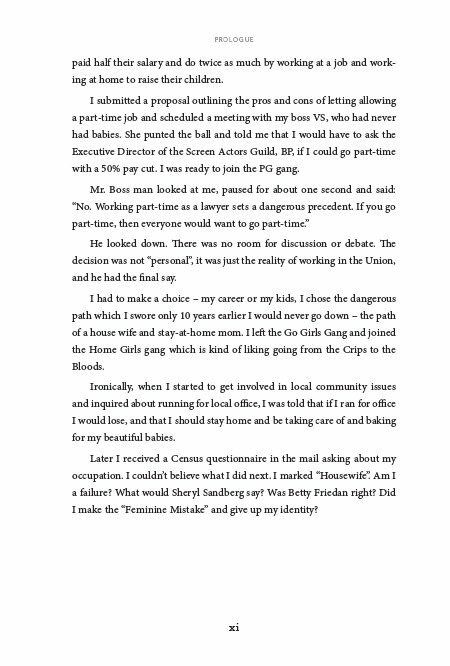 The decision was not “personal”, it was just the reality of working in the Union and he had the final say. Pamela Conley Ulich was born in Kansas, but calls California home. Pam was raised back in the days when a working middle-class family could make ends meet. When she was 18, she followed her dream to live in the great State of California. She obtained a Bachelor of Science from the University of California San Diego while working at Central Library and Scripps Library to help pay her tuition and books. 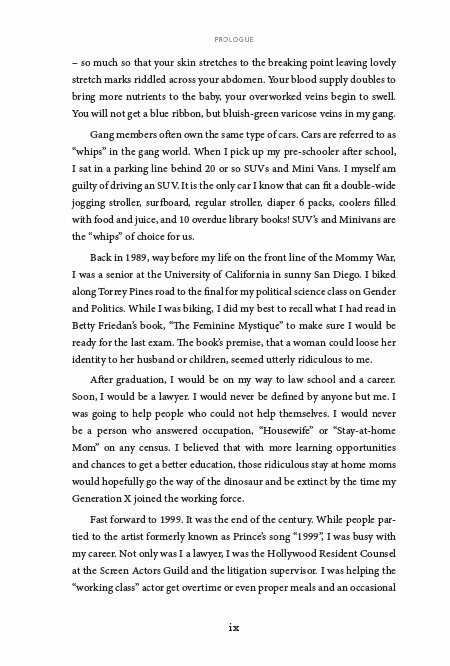 Pam was the first in her family to attend law school and passed the California bar in 1993. Pam has always been someone who questions the status quo - someone who stands for what she believes in. From a young age, Pam has challenged the system. Back in the early 70's, she was one of the first girls to play in an all Boys Baseball League. While more common today, Pam was a trailblazer and that spirit can be seen throughout her life today. Pam is fearless. From her volunteer work in Congresswoman Pat Schroeder's office fighting for families and equality to her work in the community serving on the City Council and as Mayor she had been a clear voice, undaunted, an underdog, with the spirit of a pit bull when circumstances require. Pam is driven by her family and friends and the struggles of the working women and men. Throughout her life, Pam has served others. In law school, she volunteered at Legal Aid. 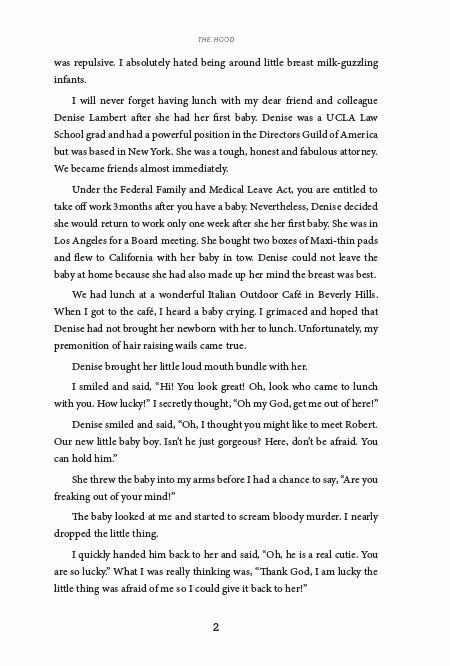 Her first legal job was practicing labor law for the Union side firm in the Valley (Encino). She fought to protect workers from unfair labor practices before the National Labor Relations Board. She served eight years as legal counsel for both the Screen Actors Guild and Directors Guild of America and was an Adjunct Professor at Pepperdine Law School teaching Entertainment Law Seminars and Labor Law. After 9-11, Pamela wanted to spend more time with her young infant and toddler, and asked to work on a part-time basis. The Screen Actors Guild Union said working "part-time" would set a dangerous precedent so Pamela had to make a choice between her family and her career. In 2002, she chose her family and started writing and working at raising her two young children. She took her small children to the LA County Library often and was inspired to make her community library better. When she decided to run for an open seat on the Malibu City Council in 2004, she was told by one local politician that she should stay home and bake cookies for her kids because she would "lose the election". Pam won the election and was reelected in 2008 with the highest votes to serve on the Malibu City Council and served as the Mayor of Malibu during the 2007 fires. She also spearheaded the Malibu Library Needs Assessment to improve library services and worked with LA County to fund the $6 million to Library Renewal project. She was termed out of office in 2012. She received the Dolphin Award in 2011 for her outstanding contributions to improving one or more aspects of Malibu’s community life. In 2014, she founded Team Love to take money out, and put love in to politics and ran for LA County Supervisor and garnered nearly 10% of the vote. She co-founded Malibu Green Machine, Malibu Task Force on Homelessness, Malibu Community Assistance and Resource Team, is active in Childhelp USA and created Moms Pod a blog by Moms, for Moms, to simply help Moms! 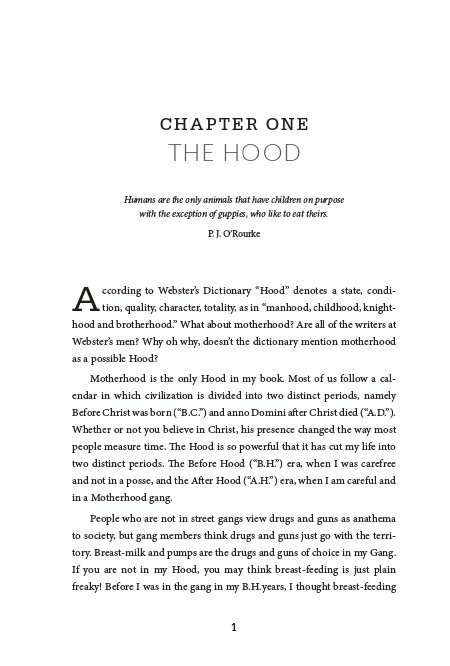 10% of all net proceeds from the sale of "The Hood" will be donated to charities that help Mothers.